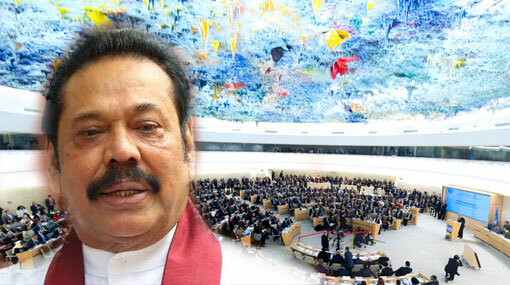 The party leaders of Joint Opposition, including Leader of Opposition Mahinda Rajapaksa, have directed a letter to President Maithripala Sirisena calling for his immediate attention on the content of the resolution that is to be passed at the 40th session of the UN Human Rights Council in Geneva. The letter says that the content of the resolution indicates an international influence on the internal affairs of the country and it is deplorable that the resolution was presented the Geneva session under co-sponsorship of Sri Lanka. It further read that the resolution includes several proposes such as monitoring of constitutional amendments of the country, restructuring the armed forces and police, establishing a mechanism for decentralizing power, removing or amending rules and regulations on security. The letter goes on to say that the implementation of this resolution can severely affect the sovereignty and territorial integrity of the country. The party leaders have, accordingly, requested the President to remove the co-sponsorship of the resolution and to instruct the Sri Lankan ambassadors in Geneva to urge the other countries to stand by Sri Lanka in this regard. The letter was signed by Leader of Opposition Mahinda Rajapaksa, Leader of Mahajana Eksath Peramuna MP Dinesh Gunawardena, Leader of Communist Party of Sri Lanka MP Raja Collure, Leader of Lanka Sama Samaja Party Prof Tissa Vitharana, Leader of National Freedom Front MP Wimal Weerawansa, Leader of Sri Lanka Mahajana Pakshaya Asanka Navarathne, Secretary General of Desha Vimukthi Janatha Pakshaya D. Kalansooriya, Leader of Pivithuru Heral Urumaya MP Udaya Gammanpila, Leader of Democratic Left Front MP Vasudeva Nanayakkara and Chairman of Sri Lanka Podujana Peramuna Prof G.L. Peiris.